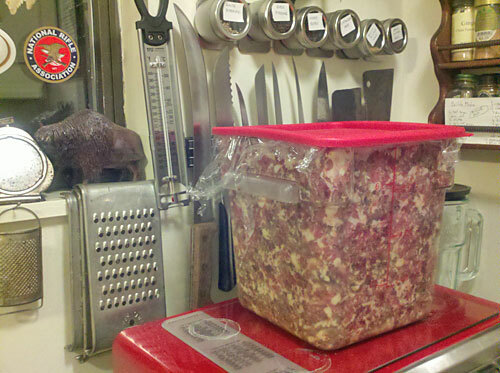 Rinella is processing this bin of bear meat into summer sausage. Bear meat is highly edible and can be quite delicious depending on what the bear's been eating and how it's been handled. But before you start messing around with bear meat you need to consider the risk of trichinosis. It's a disease caused by infection of larvae from a type of parasitic round worm known as Trichina spiralis. The worm is the reason why you're traditionally supposed to cook your pork to well done, though trichinosis has been largely eradicated from domestic pork. Nowadays, over 90% of U.S. trichinosis cases are attributable to bear meat, though even that number is relatively small and usually includes far fewer people than your average high school classroom. Other known vectors of the disease in recent decades have included mountain lion, wild boar, and even walrus. Animals contract trichinosis in the same way that humans do, through the consumption of flesh that is infected with the worms. Domestic pork used to carry trichinosis largely because of the practice of feeding them uncooked garbage; rats and mice in the garbage were consumed raw along with the trash and the rodents passed along the disease. In 1980, uncooked garbage was banned as pork feed; since then, cases of trichinosis in pork have all but vanished. Bears, obviously, have not gotten this memo. They still eat whatever they please. In many areas, it's basically just a matter of time before an individual bear eats something and picks up the worm. In Montana's Lincoln and Sanders Counties, 100% of bears over six years of age have tested positive for the parasite. The first bear I ever killed, well over a decade ago, was an eighteen-year-old bruiser from Lincoln County. I cut out an ounce or so of his tongue and sent it for testing at Montana State University in Bozeman. Sure enough, the test results came back positive. The state informed me that I was excused from the wanton waste laws, which require that all bear meat be salvaged and used. However, I was ineligible for a new bear license. By then I'd already processed the meat and had 87 pounds of ground burger and close to 60 pounds of steaks and roasts. A basic survey of literature on the disease suggested that the parasite was very easy to kill with thorough cooking. An internal temperature of 137 degrees Fahrenheit is all it takes, though obviously you want to go a little hotter to make sure. Also, there is strong evidence--though not official government endorsment-- to support the conclusion that freezing infected meat for a month at a temperature lower than 5 degrees will kill it. So I went ahead and bought a trusty meat thermometer and started eating bear burgers and bear steaks. Obviously, I'm still alive. Now, I don't even bother testing my bear meat. The results are not going to alter my behavior, no matter what they are. I'll still eat my bear meat, cooked to a medium doneness. 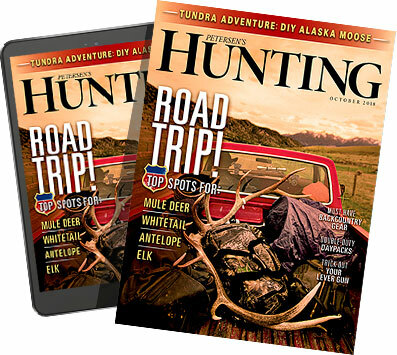 And even if you contract trichinosis, it doesn't mean you've had your last bear hunt. Early symptoms, if any, include muscle fatigue, diarrhea, heartburn, and fatigue. If you catch it early, it's easily treated. So go ahead and eat that bear meat in your freezer. You've got no excuse to let it sit in your freezer until it's freezer burned. Remember: you kill it, you eat it.